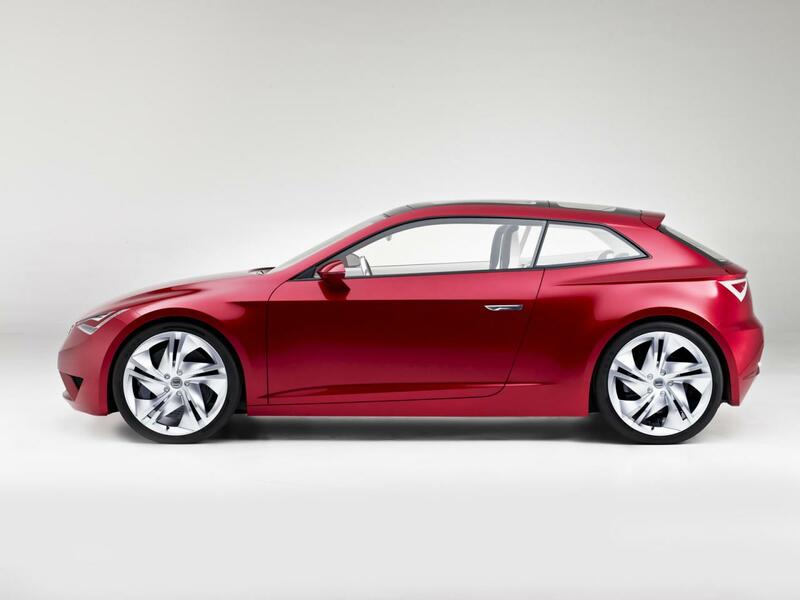 SEAT is presenting at the 2010 Paris Motor Show its clear vision of a super-compact sports coupé for the urban mobility of the near future. The first version of the SEAT IBE was already presented in Geneva; since then its design, technology and interior have been further developed. Now on show is its interior, which is incredibly spacious and versatile for this vehicle format, as well as an innovative concept for individualised connectivity and infotainment. 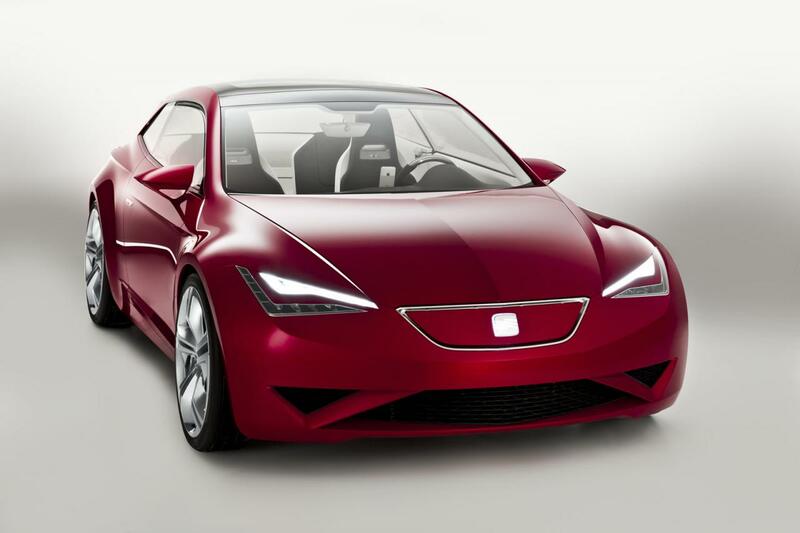 Driving fun and dynamics are at the forefront with the SEAT IBE, as is clearly evident with just one look at the red paintwork of the concept car. The little sports car is low and wide, with powerful proportions and a concentrated gaze delivered by the razor-sharp lines of its LED headlamps. With its short body length of only 3.83 meters, it is the ideal fit for the urban mobility of the young and young at heart. And the SEAT IBE combines perfectly its sports car character with innovative technology. The all-electric drive facilitates local zero-emissions driving fun, while the powerful motor with 75 kW (102 hp) and the low weight delivered by intelligent mixed-material construction guarantee refined performance. Alongside the technical concept, the design of the SEAT IBE also points to an exciting future. Its athletic styling and clear, precise lines indicate the next evolutionary step in the SEAT design DNA. Style elements with unmistakable character - reduced to the minimum but perfectly executed – demonstrate the strategic quality of SEAT design in the development of future model generations. The SEAT IBE takes a unique approach to combining dynamic design and compact sporting character with incredible usability. It is conceived for the urban conurbations of Europe, like Paris, London, Berlin or Barcelona. Here is where the IBE will come into its own with zero-emissions driving fun, exceptional manoeuvrability, an impressive amount of space – and, of course, with a cool look courtesy of its clear and extroverted design language. 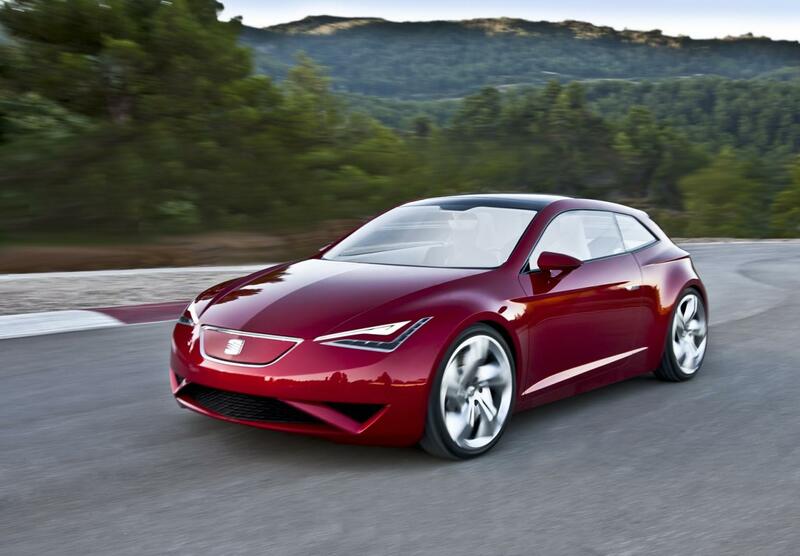 The SEAT IBE is a super-compact 2+2 sports coupé. At just 3.83 metres short, it undercuts the successful SEAT Ibiza by around 20 centimetres. Yet, at an unusually wide 1.77 metres and only 123 centimetres high, the IBE possesses the classic proportions of a sports car. As a 2+2, the SEAT IBE is perfect for the lifestyle and requirements of the young or young at heart. There is ample space for two, with plenty room in the back for the option of a trip for four. The luggage compartment is sufficient for a shopping trip, while the folding rear seat backs offer additional space for leisure gear, sport equipment or weekend luggage. The rear seat backs can be folded individually to form a flat surface that is level with the floor of the luggage compartment. The IBE can also be used as a three-seater, with plenty of room for luggage. The SEAT IBE is an all-electric vehicle that generates zero local emissions and has a package layout optimized for this new technology. The drive motor is located together with the power electronics at the front of the car. Their compact dimensions facilitate the extremely flat and dynamic contour of the bonnet. The lithium-ion battery is positioned in the rear. Thanks to an incredibly compact independent rear suspension layout, the energy storage unit fits beneath the floor of the luggage compartment. With a maximum output of 75 kW (102 hp) and 200 Nm of torque, the power unit delivers exactly the kind of dynamic driving fun promised by the exterior styling. The city dash from 0 to 50 km/h takes only 3.6 seconds; within 6.6 seconds, the IBE has reached 80 km/h, and after only 9.7 seconds it arrives at 100 km/h. This impressive performance is a function not only of the powerful off-the-line characteristics of the electric motor, but also the low weight of the SEAT IBE, which tips the scales at only 1,100 kilograms. Intelligent lightweight engineering is the key, as well as the proven technological efficiency of aluminium and steel in its construction. The continuous power rating is limited to 50 kW (68 hp), with the top speed pegged at 160 km/h – which is more than enough to cut an impressive figure even on urban motorways. Battery capacity is 18 kWh and set up for a range of around 130 kilometres, which is plenty to cover all the daily mobility requirements of city life. SEAT offers a solution of compelling logic for the demands of the mobile generation for connectivity and infotainment. The basis is the owner’s individual smart phone – such as an iPhone. Nowadays, these devices are more than just communications centres for phone and e-mail; they store their owners’ contacts and their music selection, they can navigate, receive traffic updates from the internet... the list goes on. The number of functions available today is virtually inexhaustible. In the SEAT IBE, the driver can use a wireless application to connect his smart phone to the IBE and conduct an on-line check of the car's systems, including the battery and a trip computer display. An album or a song can be selected from the smart phone and heard on the car's sound system by pressing the “drag to car” option. The dash screen and the steering wheel touch controls simplify operating and navigating the integrated infotainment menus. The benefits – the data on a personal smart phone are always up-to-date and complete, and its operation is familiar. All manner of assistance and navigation functions can be used via special apps, and multimedia content stored in the device can be downloaded and accessed. The system delivers the greatest possible individualisation at low cost. Personal smart phones can be updated inexpensively or replaced with a new model. Within the vehicle itself, there are no costs associated with in-car systems that are comparatively complex to update. On opening the door, one is immediately struck by the surprisingly spacious interior of the SEAT IBE. The room inside the compact sports car has been carefully optimised and is perfectly dimensioned for a dynamic and social lifestyle - as a two or three-seater with a generous luggage compartment, or as a 2+2 with a surprising amount of room, even in the rear. Its power sunroof underscores the bright and airy character of the interior. The clear and driver-oriented architecture is dominated by the raised dashboard that almost seems to float. It is supported on an extremely narrow centre console that flows smoothly into the centre tunnel. All interior elements are very minimalist, which benefits the usable space – and also the weight. One example is the sporty, contoured seats; the lightweight plastic buckets make them very slim, while the hi-tech foam padding delivers optimum seating comfort. The comfortable and spacious atmosphere is enhanced by the colour concept that creates an exciting contrast between the base colour “Ceramic White” and “Charcoal Dark” on the dashboard, seat upholstery and door panels. The large info display facing the driver supplies vehicle information like speed and charge status, and enables access to and operation of functions from the user’s personal device/smart phone. Most of the display’s functionality is accessed via touchpads on the steering wheel spokes. The other operating controls are also reduced to the bare minimum. The display is flanked by the indirect air vents and two control panels. These house the lighting and air conditioning functions and are just as minimal as the drive selection controls located on the centre console. Thanks to the electric drive, the buttons for P, R, N and D are more than enough. Three further buttons are sufficient to operate the electric parking brake, the AutoHold function and the E function that activates the efficient driving mode aid. The IBE cuts an impressive figure from the very first glance, with its powerful stature and its classic sports car proportions. The two-door package also looks very sporty, with its extremely low bonnet and long roofline. Yet it interprets these styling elements in a unique way, in a compact format and optimised for urban mobility. Together with the 19-inch wheels, the short front overhang and the muscular rear with virtually no overhang add to the highly charged and compact look. For its appearance at the 2010 Paris Motor Show, the SEAT Technical Centre has further developed the IBE and brought even greater sharpness and precision to a host of details. This applies primarily to the front end with its LED headlamps that are as sophisticated in their design as they are distinctive. They add even greater emphasis to the characteristic V shape that gives it its signature look. The entire front end takes a powerful V form that then carries on through the bonnet. Emphasis has been added to the air vents in the lower front section, where sharply formed triangles echo the styling of the LED lights – which are also found on the wing mirrors and in the rear lights. The SEAT logo is located at the front on a trapezoidal functional surface. The alternative drive enables an extremely high degree of consistency in the design – because the electric motor and its power electronics require less packaging space, it was possible to stretch the bonnet a lot flatter across the front end than would have been possible with a conventional engine. The side profile of the IBE emphasises its powerful stature – the long roofline, with the dark-tinted glass roof providing a clear contrast to the rich red of the paintwork. The broad shoulders, the narrow glass surfaces, the powerfully formed flanks and the large diameter wheels with their aerodynamically optimised, double-spoke design all underscore the dynamic appearance. Yet the 175 format tyres are very reasonably sized – and thanks to their low rolling resistance, they contribute to the high efficiency of the electric concept car. The highly distinctive shoulder line over the rear wheel arches and at the back further reinforces the look of precision. With its tight radii, this line represents a considerable challenge for the toolmakers, and provides further evidence of SEAT’s excellent manufacturing skills. The dainty door handles can be operated with a single fingertip. The socket for the charging cable can be found on the right side. The rear end echoes the characteristic forms of the front and reinterprets them. The split rear light clusters, featuring LED light guide technology, once again display the “arrow” thematic in their triangular casing. The entire vehicle is completely devoid of ornamentation – good design needs no adorning. Every single line has its function in structuring the volumes and surfaces of the car; every muscle emerging from the form emphasises the sporty design. The reduction of forms, their consistent implementation and the precision in every detail are fixed elements of the SEAT design philosophy – and will be even more evident in future. 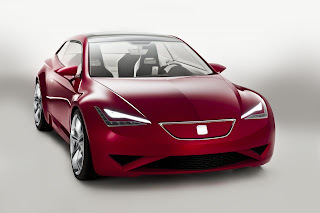 SEAT is a vehicle manufacturer with a particularly high degree of expertise in environmentally friendly technologies. Recent years have seen fuel consumption systematically reduced across the individual model ranges, with SEAT ECOMOTIVE emerging to enjoy enormous success on the market as a brand for exceptionally fuel-efficient vehicles. The pinnacle is the Ibiza ECOMOTIVE-E which, in its latest iteration, consumes only 3.4 litres of fuel per 100 kilometres and emits only 89 grams of CO2 per kilometre despite its powerful 55 kW (75 hp) output. SEAT continues to expand the ECOMOTIVE offering; the Leon, Altea and Altea XL ranges have also been enhanced with these exceptionally low-consumption TDI variants. The new Alhambra ECOMOTIVE-E, too, sets an absolute best in the full-size MPV segment with a fuel consumption of only 5.5 litres. The next step in the SEAT strategy is the Leon Twin Drive ECOMOTIVE. Its drive is derived from a combination of an internal combustion engine and an electric motor. Yet it is far more than a conventional hybrid; it is a plug-in vehicle. Its lithium-ion battery can be charged at a standard electrical socket and has a range of around 50 kilometres. For longer trips, the internal combustion engine takes over. The first series production version of the Leon Twin Drive ECOMOTIVE is planned for 2014. The Technical Centre is targeting the all-electric vehicle, with the SEAT IBE concept car serving as a taster. At the same time, the IBE marks the start of a targeted project for the promotion and development of electric mobility in Spain.